How often do we hear something along the lines of “We won’t be able to feed 10 billion people by 2050 without GMOs”? A friend said something similar to me in relation to a recent piece on the Bt and Roundup Ready traits. I replied, “I disagree a bit with that framing. 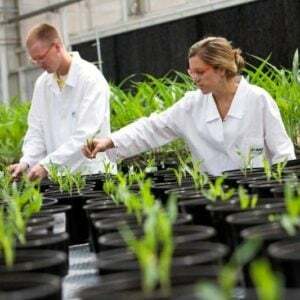 I think they will be an important set of tools in the toolbox, though for some crops they may well provide the only path forward via disease resistance traits. There are a lot of other tools that will prove equally crucial.” In turn, he asked me if I thought it would be possible to feed more than 10 billion humans without them. My immediate reaction was “Of course.” My next thought was that the whole concept of “feeding the world” is meaningless. And it’s meaningless in two ways. 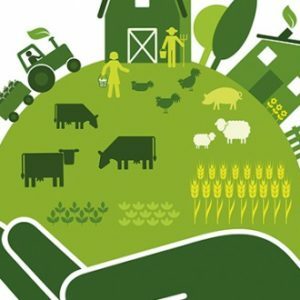 What does it mean to feed the world? The first way that it is meaningless is that the term is undefined, and different people use it to mean different things. So in conversations across political/cultural tribes, it’s functionally meaningless. Have we met the condition of having fed the world only when there is no hunger? Or does it mean simply producing more than enough calories to feed everyone and then letting the market and governments decide who eats and who doesn’t? Does producing junk food and soda count towards Feeding the World? Does it count when a restaurant serves a plate of “Parmesan cream pasta” topped with meatballs, sausage, pepperoni and bacon the size of your head and clocking in at 2,310 calories — the full days energy requirements for a medium sized adult —with 25-40 percent of that dish ending up in a landfill? Does it refer to ending hunger? Or does all food production count, no matter how decadent, wasteful, or lacking in wholesome nutrition? Depends on who you ask or who doing the listening. AND … when we refer to feeding the world, is it implicit that we mean “feeding the world without wrecking the environment beyond repair”? When people outside of farming and major food companies hear the phrase, they mostly hear “end hunger“. 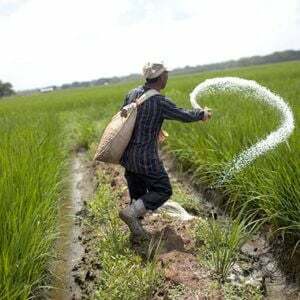 When the agriculture community uses it they are referring to something that is much more about commerce, but essential, necessary commerce — as opposed to the commerce that results in phone apps that involve popping bubbles. This first became clear to me in a discussion in the Food and Farm Discussion Lab forum regarding claims that GMOs would feed the world. I had posted an article in Mother Jones titled “No, Giant Farms Are Not Feeding the World. They’re Feeding Canada“. The piece went over the data on where US commodity crop exports end up. 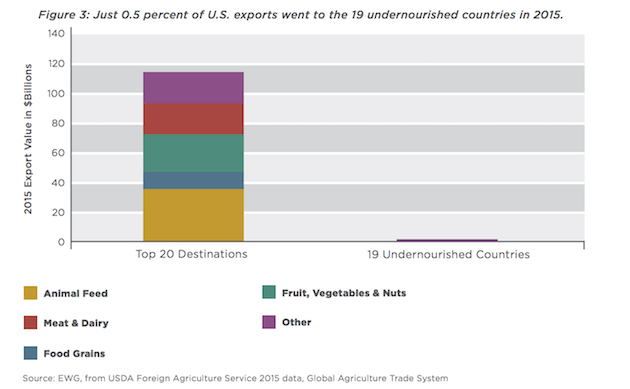 Only 0.5 percent of US agricultural exports went to the 19 most malnourished countries in 2015. 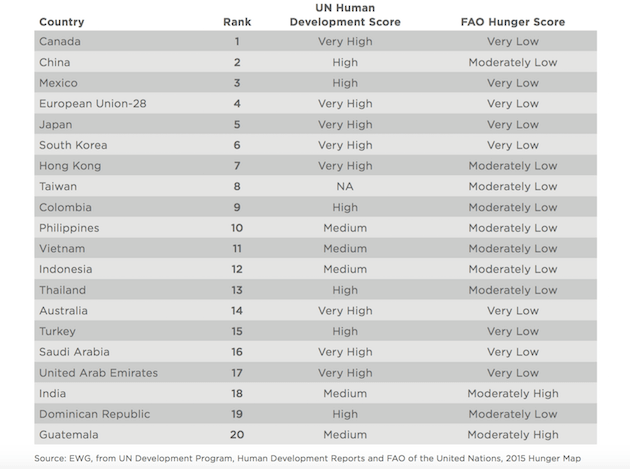 Meanwhile of the top 20 destinations for US exports only India and Guatemala — ranking at 18 and 20 — rate high on the FAO hunger score. I would tend to agree with Tom Philpott here that people should tread a little more lightly in making the “Feeding the poor and hungry” appeal when defending an unpopular or misunderstood aspect of the industrial food system. It generally comes across as propaganda, largely because it is. That said, where I think we would disagree is that I think the poor and hungry parts of the world need more industrial food production, not less. Clearly, US (and Canadian) exports are a significant addition to the food supplies of countries that can pay for food — so yes, we are “feeding the world”. Just because a majority of our exports do not go to countries that are not capable of paying for food does not diminish the role trade & exports play in helping a lot of the world in being well nourished. I don’t have the data readily available, but I suspect that both the US and Canada are major suppliers of food aid to the most impoverished peoples of the world. Granted, creating an abundant global food supply that kept food prices low in countries with at least moderately functioning economies does contribute mightly to reducing hunger and creating stable societies, but the idea that feeding the world was essentially a proposition of pure commerce struck me as less heroic than I’d previously been reading it. I was assured by a number of people that it was never meant to imply anything heroic. That didn’t strike me as quite right. I’d always heard it in the ag community as part of the reason why farming — hard work, risky, not particularly well understood or appreciated — should be understood as a noble calling above beyond any financial renumeration. You can follow the discussions here and here. Teske is president of the Kansas Farmers Union, and carries the weight of experience in his sigh—the same world-weariness I heard in other farmers’ voices as I traveled the state. For years, he’s watched friends and neighbors urge their children to go work in the city because the land doesn’t offer enough of a future. Now it appears they were right. And you can see it all levels of identity and storytelling in ag. Consider MorganMeyers, a PR and branding firm that specializes in food and ag companies. Their tagline is, “We are a strategic communications firm that builds, protects and promotes great brands that help feed the world.” It’s hard not to take that as the rationalization for why they are proud of their work – they see their clients engaged in something noble. I certainly took it that way when I stumbled across them in a tweet by a new recruit, fresh out of college who was psyched about his new job with a company that helps #feedtheworld! While they have clients that I (as proponent of industrial agriculture) do see as contributing to feeding the world — Monsanto/Seminis (seeds) and Case IH (farm equipment), it seems a stretch to when I see Miller Beer, Phillip Morris, Hershey’s, Pillsbury and McDonald’s on their list of clients. Certainly people eat products made by those companies, but that would seem to me more in the category of “People Need to Eat and Lots of Them Have Money. If We Don’t Do It, Somebody Else Will” more than “We’re Feeding the World!” category. If Miller Beer is feeding the world, then the phrase doesn’t seem to mean much of anything other than “People With Money Will Pay for Food”. Either way, on this count, an argument about the necessity of genetically engineered crops (or livestock or salmon) that hinges on the idea of feeding the world is likely to suffer from the risk of people talking past each other because they take the idea to mean different things. So what, exactly, is the challenge at hand? The population we’re going to need to feed by 2050 is in the 9-11 billion range. 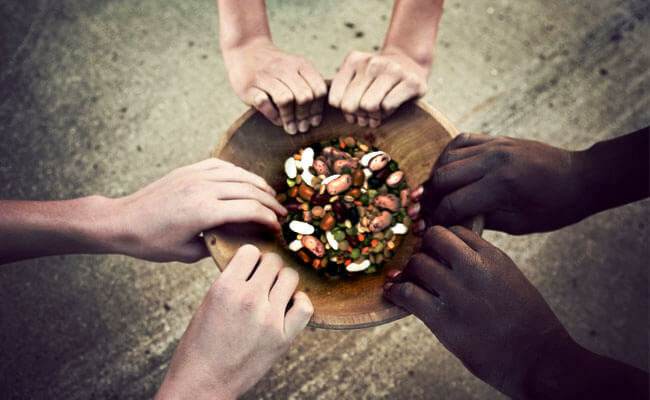 So what can we agree on to reasonably fulfill the condition of feeding the world? How much structural hunger is tolerated? How much disruption is allowed for? What range of spending on food as a percentage of a median income counts as accomplishing the task? How much environmental damage and degradation can be tolerated? Taking the last first, I’d suggest that success means leaving the environment in better shape than we found it. Maintaining or shrinking the current land use footprint, improving water efficiency so as not to tip major droughts in catastrophes, improving soils and water quality, and first and foremost reducing the greenhouse gas emissions of farming commensurate with what is necessary to bring emissions down to 350 parts per million … avoiding “2 degrees Celsius limit. Take your pick. On disruption and portion of household income spent on food, I wouldn’t see success in a scenario with greater than current rates of farm closures that result in bankruptcies, suicide, and long term unemployment — or much of any increase in the portion of incomes people of modest means have spend to keep themselves fed. As to structural hunger, that’s a bit tougher because it is largely a function of income, not food supply. In some locals that rely entirely on subsistence farming it is related to food supply. There isn’t much that improvements in production ag can do to feed people that don’t have money, that’s function of political and economic reform, much more than agricultural reform. But it should be a goal that either subsistence farming has been made obsolete, or that it can be done robustly with far greater stability. That’s at least a broad thumbnail of what I personally would consider successfully feeding a population of 10 billion people between now and 2050. 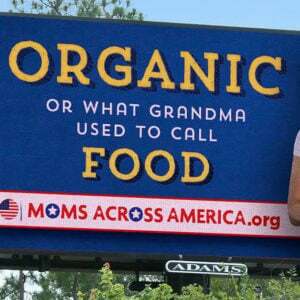 Can we do it without GMOs? We can probably broadly meet most of those conditions without biotech crops and animals, but it will be a lot easier with those tools in the toolbox. If we had to, I don’t doubt that we will end up feeding in some way whoever is around. If food becomes scarcer and more expensive, that will throttle population growth, so the two sides of the challenge meet asymptotically. I have come to see the whole “feeding the world” as a non-issue. It’s a meaningless proposition. Not to go full neo-liberal, but at the most basic level its an issue markets will roughly sort out no matter what happens. We will “feed the world” no matter the population. The questions is at what environmentally and economically and at what level of equity to the bottom billion?